PerfeCTa SYBR Green SuperMix is intended for molecular biology applications. This product is not intended for the diagnosis, prevention or treatment of a disease. PerfeCTa SYBR Green SuperMix is a user-friendly, 2X concentrated reaction mix that simplifies setup and is pre-blended with reference dye for optimized product performance. This proprietary buffer technology stabilizes a high concentration of SYBR Green I dye to ensure maximum optical signal with low abundance or small targets (such as microRNA). Successful detection with a non-specific, dsDNA intercalating dye requires precise target amplification as off-target primer elongation will contribute to overall fluorescent signal and lead to over-reported relative abundance values. This reagent is powered by a highly-processive, ultra-pure Taq DNA polymerase mutant with stringent, ultra-pure AccuStart™II antibody hot start technology that allows ambient room-temperature setup and maximal enzyme kinetics after rapid, irreversible denaturation at 95°C. 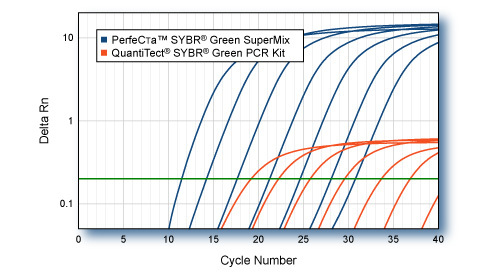 Log-fold serial dilutions of qScript&trade; cDNA from HeLa cell total RNA (100 ng to 0.1 pg) were analyzed by SYBR Green qPCR following each manufacturers protocol. Averaged plots of triplicate qPCR reactions are shown. Five ruminally fistulated steers were used in a 5 × 5 Latin square design to determine the effects of increasing dietary fat and sulfur from condensed distiller’s solubles (CDS) on the ruminal microbiome. Treatments included a corn-based control (CON) and 4 levels of CDS (0, 10, 19, and 27%) in a coproduct-based (corn gluten feed and soybean hulls) diet. Fat concentrations were 1.79, 4.43, 6.80, and 8.91% for diets containing 0, 10, 19, and 27% CDS, respectively. Steers were fed for ad libitum intake once daily. After feeding each diet for 18 d, ruminal samples were collected 3 h after feeding on d 19. Samples were separated into solid and liquid fractions. Microbial DNA was extracted for bacterial analysis using paired-end sequencing of the V3 through V4 region of the 16S rRNA gene on the MiSeq Illumina platform and quantitative PCR of selected species. Orthogonal contrasts were used to determine linear and quadratic effects of CDS inclusion. Increasing CDS inclusion decreased (linear, P < 0.05) α-diversity and species richness in the liquid fraction. Analysis of Bray–Curtis similarity indicated a treatment effect (P = 0.01) in the liquid fraction. At the phyla level, relative abundance of Bacteroidetes decreased in steers fed increasing dietary inclusion of CDS as Firmicutes increased to 82% of sequences for the 27% CDS treatment. Family Ruminococcaceae increased (linear, P < 0.01) 2-fold in the liquid fraction when feeding CDS increased from 0 to 27% CDS, yet genera Ruminococcus tended (P = 0.09) to decrease in steers fed greater CDS. The most abundant family of sulfate-reducing bacteria, Desulfovibrionaceae, increased (P < 0.03) in the solid and liquid fraction in steers fed additional dietary CDS and sulfur. Relative abundance of family Veillonellaceae and Selenomonas ruminantium were increased (linear, P ≤ 0.02) in the solid fraction as steers were fed increasing CDS. There were no effects (P > 0.10) of feeding increasing dietary fat from CDS on fibroylytic genus Fibrobacter in either fraction. Results demonstrate increasing fat and sulfur from CDS in a coproduct-based diet markedly alters the liquid fraction ruminal microbiome but does not elicit negative effects on relative abundance of identified fiber-fermenting bacteria. Yinyang1 (YY1) participates in protein-DNA, protein-RNA, and protein–protein interactions and regulates developmental processes and disease mechanisms. YY1 interactions regulate a range of important biological functions, including oocyte maturation, epithelial to mesenchymal transition, and vascular endothelial growth factor (VEGF) signaling. We tested the hypothesis that YY1 is required for inner cell mass (ICM) lineage commitment during preimplantation development. In this study, we document gene expression patterns and protein localization of key transcription factors in Yy1 global, tissue-specific, and dsRNA-mediated knockout/down embryos. YY1 protein was found in cells of preimplantation and peri-implantation embryos, and adult tissues where two isoforms are observed. In the absence of YY1, OCT4 and SOX2 protein were lost in the ICM during preimplantation and naive neuroectoderm during gastrulation stages, yet no difference in Oct4 or Sox2 mRNA levels was observed. The loss of OCT4 and SOX2 protein occurred specifically in cells that normally express both OCT4 and SOX2 protein. These observations support a role for YY1 meditating and/or regulating the interaction of OCT4 and SOX2 at a posttranscriptional level. Our results suggest that distinct mechanisms of YY1-mediated molecular regulation are present in the early embryo, and may offer insight to promote lineage commitment in in vitro cell lines. Curcumin was found to be beneficial in treating several skin pathologies and diseases, providing antioxidant protection due to its reducing properties and its electrophilic properties (the ability to activate the Nrf2 pathway and induce phase II cytoprotective enzymes). Nevertheless, clinical applications of curcumin are being hampered by its insufficient solubility, chemical instability,and poor absorption, leading to low efficacy in preventing skin pathologies. These limitations can be overcome by using a nanotechnology-based delivery system. Here, we elucidated the possibility of using curcumin encapsulated in a microemulsion preserving its unique chemical structure. We also examined whether curcumin microemulsion would reduce UVB-induced toxicity in skin. A significant curcumin concentration was found in the human skin dermis following topical application of a curcumin microemulsion. Moreover, curcumin microemulsion enhanced the reduction of UV-induced cytotoxicity in epidermal cells, paving the way for other incorporated electrophiles in encapsulated form protecting skin against stress-related diseases.